April 2011 – on my way: make it someday. I work on the beach every day, but nevertheless, I am taking a beach vacation. For the last few days I have been staying at my grandparents’ condo, which is about an hour down the coast from Navarre. They usually rent it out, but this weekend, there were no renters. So I drove over and enjoyed having the whole place to myself and reading a trashy romance novel on the beach. It’s not my usual reading genre, but on the beach, it’s about the only thing you can read. My biggest accomplishment was tanning my legs sufficiently to get rid of my five-year shorts tan. I also had some great meals. Sunday was the last morning I’d be able to go out to breakfast before work started again, so I wanted to do something special. My original plan was to check out the Hibiscus Coffee and Guest House, but it turned out that Sunday was Easter (when you are all alone, holidays aren’t on your radar), so they had something special going on. Instead, I walked literally across the street to check out the Liars Club Cafe, an excellently-named offshoot of Stinky’s Fish Camp. I got to sit at a bar and had great eggs Benedict. On my list of things to do: learn how to poach an egg. Tonight I checked out The Red Bar on the recommendation of my uncle Chris. It was a trendy spot and packed even though it was just a Monday night. After asking for a mojito, I chose a shrimp and crawfish dish for dinner. One of the pluses of dining out by yourself: everyone else had to wait 20 to 45 minutes for a table, but I got served at the bar immediately. Ha! And it was great, a fun atmosphere with live music playing in the background. Vacation is over, so unfortunately my lazy days of lying on the beach and eating food prepared by other people will be a thing of the past. Ah, well, it was good when it lasted – and I finally have a job that pays me enough so that I can take myself out to dinner every once in a while. My trip to Atlanta – which I’m now back from – was excellent for many reasons. I had a great time with my grandparents, who I haven’t seen nearly enough of in the last few years. College was too busy for me and so the last year or so has allowed me to catch up with my family, finally. But while I would have been happy to sit at their house and simply spend time with them, my grandparents had more in store for me. On Tuesday grandfather Pete and I went to a Henri Cartier-Bresson exhibition at the High Museum. I saw more than 200 amazing black and white photographs – many of Cartier-Bresson’s native France, many set in the U.S., some from India – including from Gandhi’s funeral – and a photo-essay about the Great Leap Forward in China, among many other settings. The photos were beautiful and many showed unusual and artistic composition. It was a huge treat. I miss the days when people made prints in a darkroom. 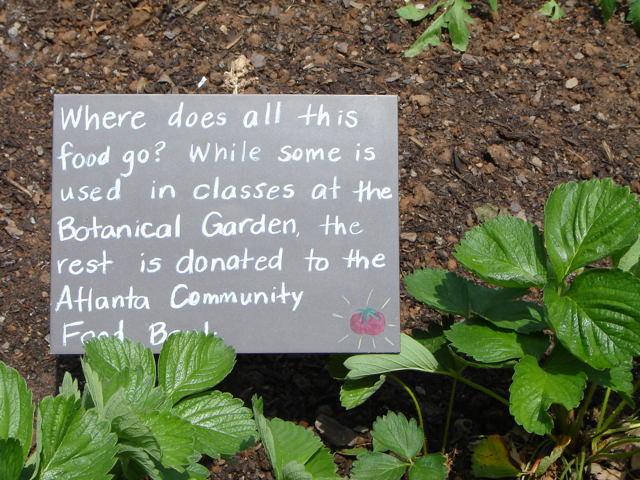 On Thursday, we went to the Atlanta Botanical Garden. I will never think of a botanical garden the same way again. I pictured, well, just a big garden with lots of plants and signs telling me their names. 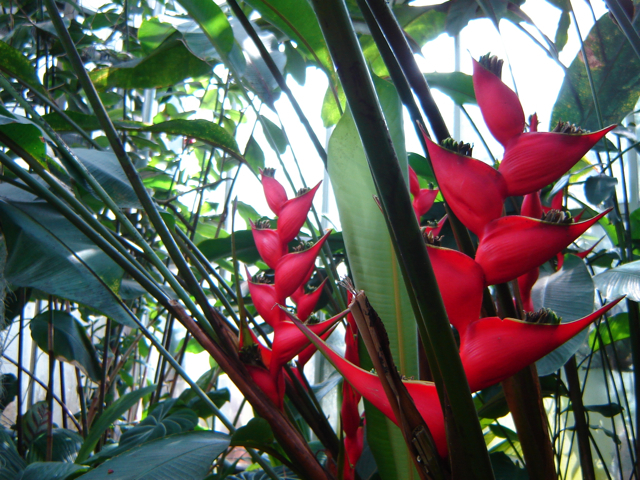 I love plants and flowers, both because of my scientific interests and because, like anyone else, I appreciate beauty – so I was excited for the trip, but I had no idea what I was about to encounter. 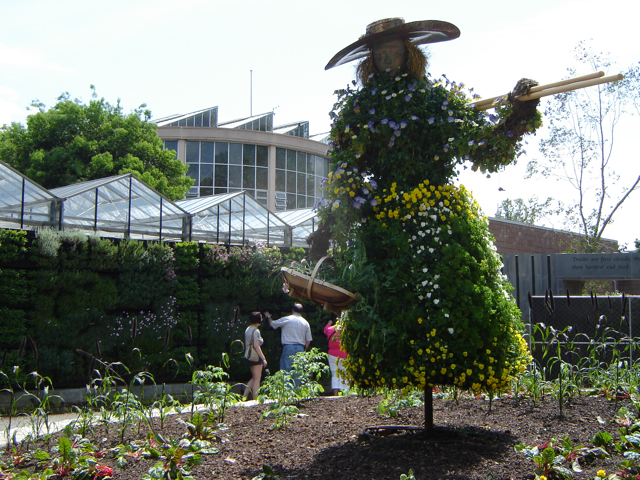 I found a happy, dynamic space – which even included a whimsical, educational children’s garden – full of not only flowers but sculptures and statues, ponds and fountains, trellises and plenty of creative landscaping. 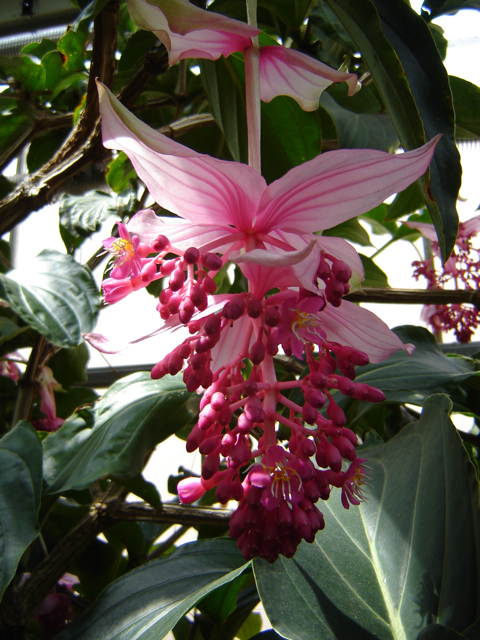 We spent a lot of time in the Conservatory and Orchid Center. 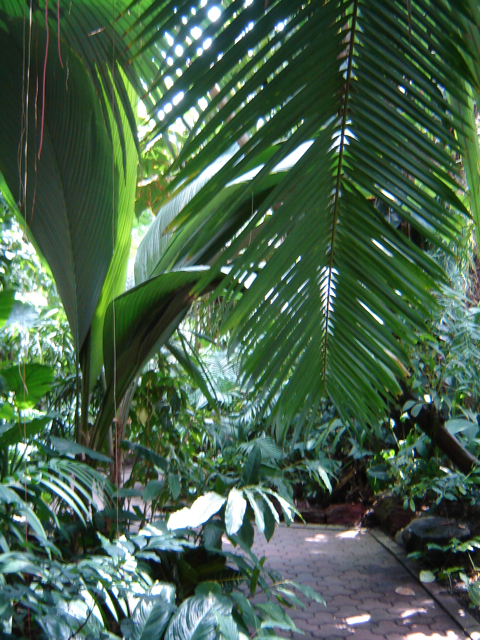 Walking into the conservatory was like entering a new world. 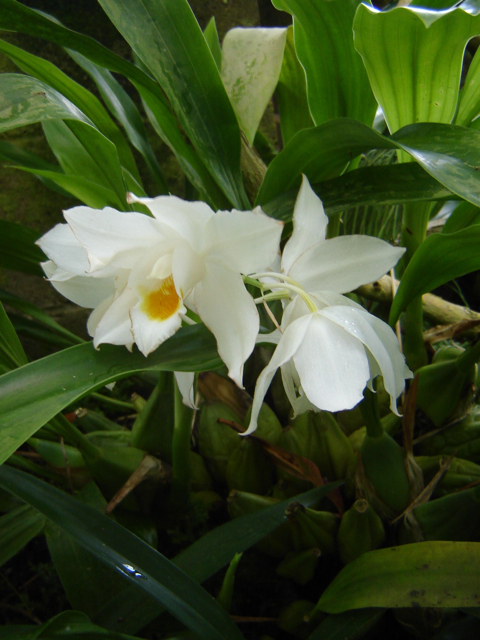 Orchids reigned supreme. So did rainforests. And so it was only appropriate that the last thing I cooked for my grandparents came from flowers. My grandfather had been requesting saffron buns all week, so we finally picked up some saffron at the store and I got cooking. Saffron is frequently touted as being the most expensive spice in the world. Its price tag is thanks to the labor required to produce it: saffron threads are the stigma, or pollen-receving reproductive parts, of a Crocus sativus plant. Each crocus has just three stigma, which must be painstakingly collected. 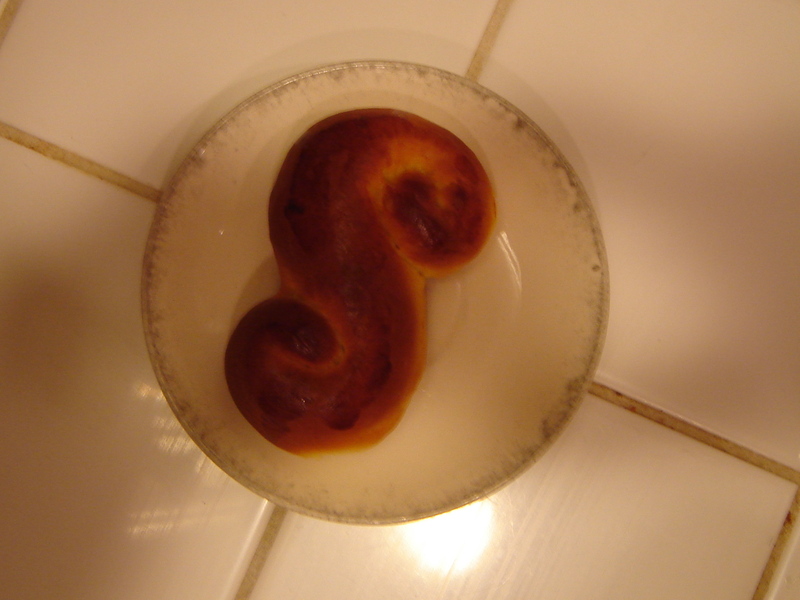 My grandmother had a recipe for saffron buns, but she said that it sometimes worked and sometimes didn’t. It also had lard in it. The only thing I ever put lard in is pasties, and I wasn’t quite ready for lardy rolls. So I looked elsewhere for inspiration, settling eventually on Scandinavian Santa Lucia buns, even though the season isn’t quite right. 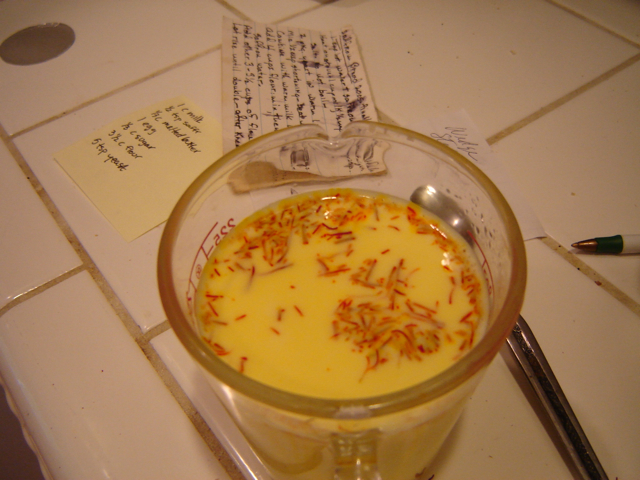 The saffron threads are red, but as soon as I dropped them into hot milk, they began spreading their signature yellow color. 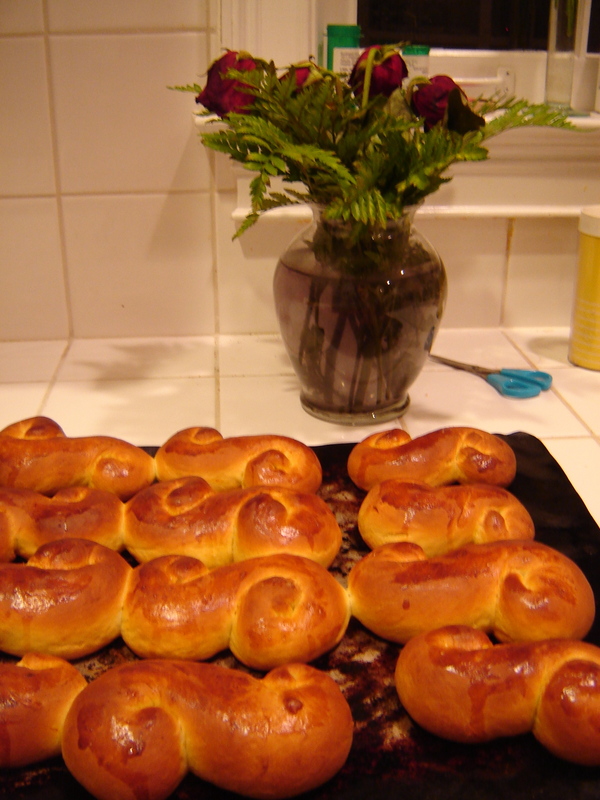 Eventually, I had made up a dough that used not lard, but butter – thank goodness! 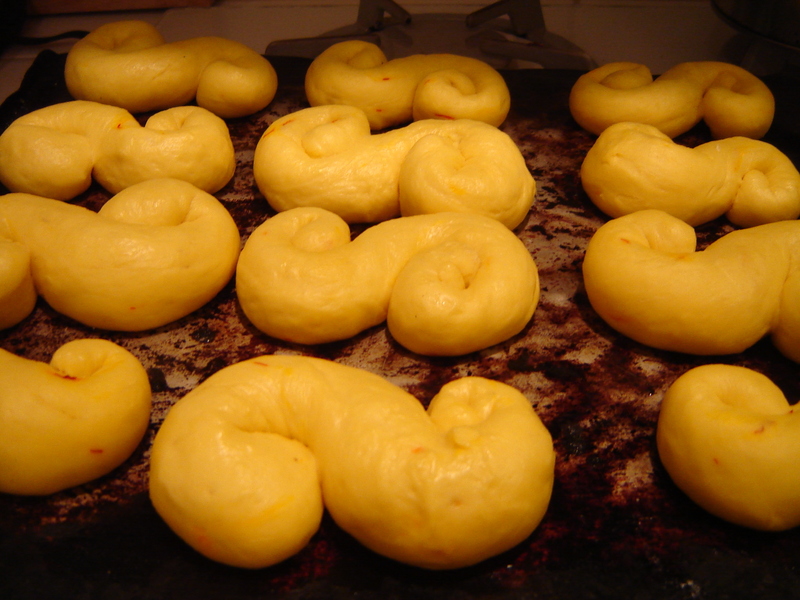 After a bulk rise, I quickly shaped the buns into their signature scrolls in the eight minutes left before dinner (a shrimp alfredo made by my grandfather – yum!) hit the table. And then I baked them while we ate dessert. In fact, I forgot about them while we ate dessert. But at some point I remembered them and after being terrified that they would be burnt into blackened lumps, I found that they were unharmed, and shiny with their quick egg glaze (it’s my new favorite way to make sweet breads look fancy). The smell when they came out of the oven was tantalizing. Even though we had just eaten dinner and dessert, we split one of the still-hot rolls between the three of us. When it’s by itself – which it was in these rolls, which lack any other spices – saffron is noticeable, but subtle. It’s not a flavor that I have often encountered, but I loved these rolls. They are unique. And honestly, even if saffron is the most expensive spice in the world, you can splurge on a packet to make some rolls every once in a while. It’s not going to break the bank. Definitely submitting this one to YeastSpotting! Start by heating the milk until it’s almost boiling. Add the saffron threads, crushing them with your fingers as you sprinkle them onto the milk. They will immediately dissolve a bit. Stir and let sit for ten or so minutes. The milk should still be fairly warm after this. Add the yeast and let sit another five minutes. I do all of these steps still in whatever vessel I heated the milk in so that it can retain as much of that heat as possible. Then, pour the milk-saffron-yeast mixture into your actual mixing bowl. Add the egg, beating well, and then the melted butter, sugar, salt, and one cup of flour. Stir until you have a lumpy but fairly uniform mixture. Add two more cups of flour and stir again. Add more flour until you have a dough that is cohesive and kneadable without making too much of a mess on your hands. Turn dough out onto a floured counter to rest while you wash out the mixing bowl and smear it with butter. Then, knead the dough for five minutes, place it in the bowl, cover with plastic wrap, and let rise 1 1/2 to 2 hours or until doubled in size. Next, divide the dough into quarters. Divide each quarter into three equal-sized portions and shape each portion into a rope, eight or ten inches long and of a uniform thickness. Shape the rope into the S-shape shown in the pictures above: start wrapping one end into a circle which coils around itself. When you have used a third of the length of the rope, switch and wrap the other end up in the opposite direction. Push the two spirals toward each other and wrap further, if necessary. Transfer all of the rolls – there should be twelve – to a greased baking sheet and let rise for another hour at least. Finally, brush with an egg glaze made of one well-beaten egg and a glug of water, whisked together. You can brush it on with a pastry brush or just your fingers. You won’t even come close to using up the whole egg, but that’s a problem I haven’t yet figured out how to deal with. Bake the rolls at 400 degrees for 15 to 25 minutes, or until they seem done. My drinkbelt hasn’t seen the light of day for quite some time – not since Monday, March, 21st to be exact. That day, I went for a short ski with Jennie Brentrup at Oak Hill in Hanover. The snow was, well, not good. But we had fun. After that, I packed my trusty training partner in a small Dynastar duffle bag patched with duct tape. The bag traveled down the east coast in my 4-Runner and ultimately was shoved under my bed, where it has stayed, mostly unopened, since I arrived in Florida. Last night, I dug out the duffle bag and filled my drink belt up with water in preparation for an early morning. It was our first day off in 25 days, and it seemed masochistic to wake up early in the morning yet again. But that’s what I wanted to do. I have been running after work most days, waiting until 6 or 6:30 in the evening when it is cool enough to work out comfortably. Instead, I wanted to run in the early morning, and do my first “very long” run of the season. To accomplish this, I resorted to an old trick. I call it the early-morning workout bribe. It’s a system I began using in Crested Butte, Colorado the summer before my senior year of college. I would start fieldwork for my thesis at 8 a.m., but because of the thunderstorms that rolled in almost every evening, it was best to train before work. When I was running, this was no problem- I could get up a little early, run from the cabin, have breakfast, and head off into the field. But when I needed to rollerski, things were more complicated. It was a 20 minute drive to get to a place with pavement appropriate for rollerskiing, and I had to take all of my work gear with me and go straight to the field afterwards. It required an earlier start and a lot more planning. So on the mornings when I rollerskied, I would buy myself breakfast and a coffee at Camp 4. Not only was their coffee delicious, but their breakfast burritos were to die for. If you are ever in Crested Butte, check it out. Camp 4 was pretty much the sole reason that I rollerskied that summer, and it was extremely effective. This morning, I tried the bribery method again, and set my alarm for 6:40, 20 minutes later than usual. I started running on the mainland side of the Navarre bridge. The foot path on the side of the main bridge felt a little sketchy – rather than being an integrated part of the bridge’s concrete structure, it was a metal outcropping. Luckily I’m not afraid of heights, because it felt a bit like I was dangling out over the Sound. 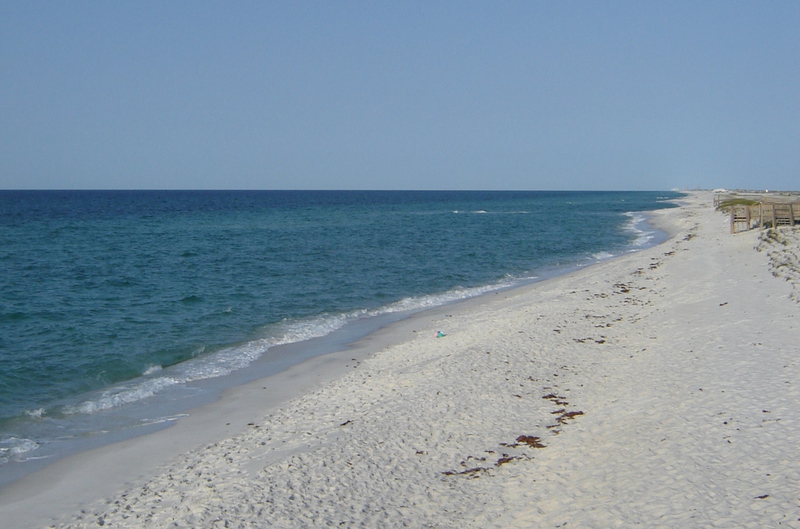 One I reached Santa Rosa Island, I turned right and ran out the bike path until I reached the start of the Gulf Islands National Seashore. I can’t say that I was running particularly quickly or efficiently, but it felt good to be out in the early morning. I assessed the beach houses as I ran by and passed innumerable walkers out in pairs or with their small dogs. I passed a place called “Sandy Bottoms” which advertised Baja Fish Tacos and might have started salivating. But I didn’t stop. 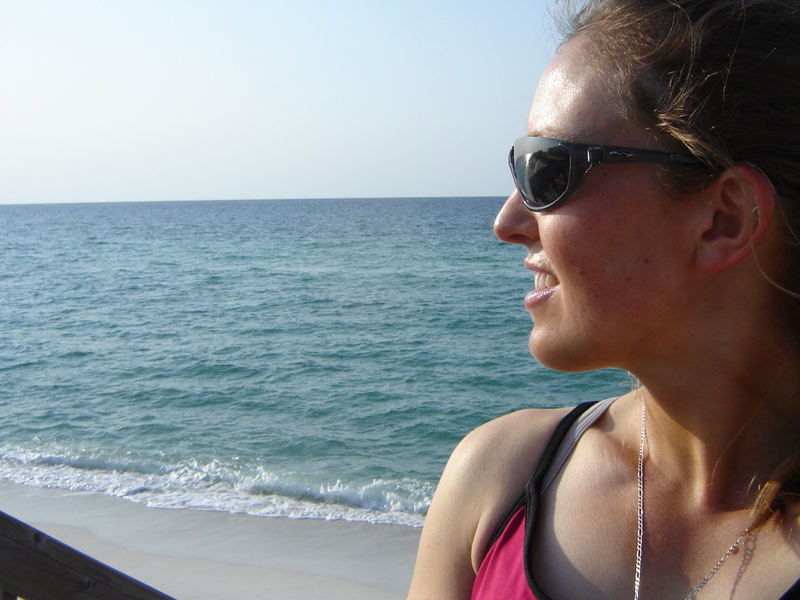 I ran out to the seashore and then turned around and stopped at a small entrance to the beach, where I took in the views and had some water (thanks, drinkbelt!). The beach looks pretty much the same anywhere, but I was interested to see the difference that four miles can make. Whereas the beach where we park and walk to work is wide and dominated by dunes, this beach was narrow. It made me remember that our usual walking route sports signs advertising that is was selected as one of America’s best restored beaches. My grandparents always talk about how the hurricanes hammer the beach and destroy the dunes, literally washing them into the ocean. 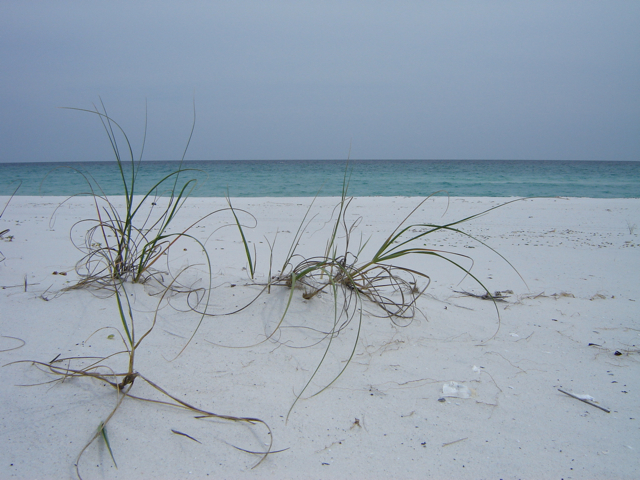 At Navarre Beach State Park, the dunes had been rebuilt, whereas a few miles away, they were left to fend for themselves. In time, they will accumulate more sand, but for now, the beach is much smaller. It was still just as beautiful. And so quiet! There weren’t even any early-morning fishermen out setting up. After running back to my car – I ran 9 or 10 miles, something I haven’t done since, hmm, October? – I stretched, put on a dry shirt, and headed out for breakfast. That was, after all, my reward for getting up early on my day off. As far as I can tell, there’s only one permanent coffeeshop in Navarre. I have passed it a few times. It’s called Higher Ground, and it resides in a cute, tiny building with a fresh fruit stand behind it. When I walked in, I was greeted by sunny, bright colors on the walls, vintage prints and advertisements, and some cheery yet calm Flamenco guitar music in the background. I took a booth and was soon sipping a capuccino and perusing a menu. Was I tempted by the gourmet veggie quiche? Yes. What about the buttered croissant with fresh fruit? Why, yes. But I could not order those things. When I imagine a perfect southern breakfast, I think of one thing: biscuits and sausage gravy. Not the crappy kind, but the good kind. This idealistic breakfast vision was born in Wakulla Springs, Florida, some years ago, when I stayed at the lodge of the State Park (which is listed on the National Register of Historic Places) with my parents and had amazing biscuits and gravy for breakfast in the beautiful dining room. And Higher Ground specifically advertised biscuits and gravy. I had to try them. I ordered “The Eye Opener”: one biscuit topped with an egg and another with sausage, all covered in gravy. I loved the food, the atmosphere, and the nice women who ran the place. I was tempted to order another coffee to go, but since I haven’t been drinking coffee in the morning, that seemed like it could lead to an overcaffeinated disaster. I also wanted to buy some more baked goods from the counter, but reined myself in. Overall, I was so happy to find a place like this in Navarre; before now I wasn’t entirely convinced that it was just a giant strip mall of a town with no local, independent character. Could I eat breakfast here every day? Ah. But then it wouldn’t be a bribe. 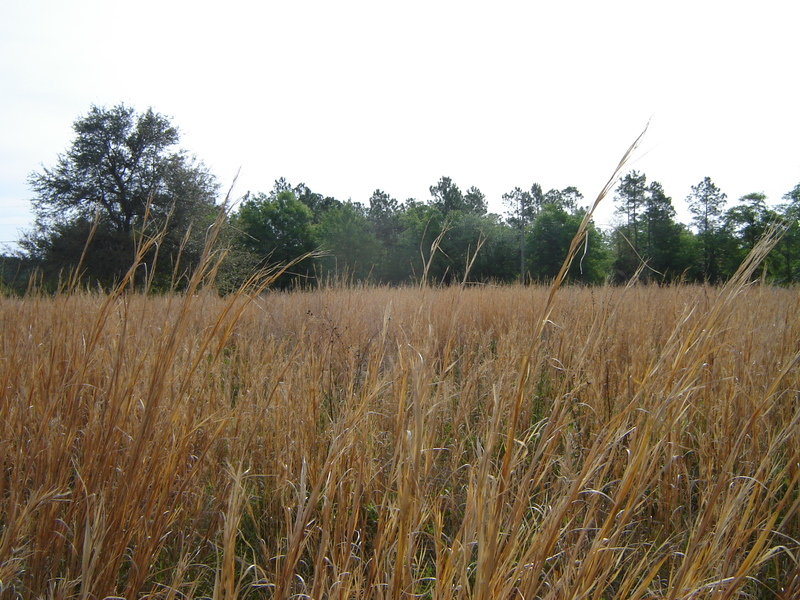 This is a field of broomsedge. In the last week, I made two day trips up to this field, which happens to be in Jay, Florida, about an hour north of our place in Navarre. The drive up to Milton is pretty in a way that I always assumed Florida could be, but hadn’t seen yet – quiet! Trees on the side of the road! Rivers meandering languidly through the forest! Milton itself, which you pass through before reaching Jay, is a cute historical town of brick buildings and character. I saw advertisements for a farmer’s market and cursed the 20 miles separating me from fresh vegetables. Back to the broomsedge. It’s not actually a sedge, but rather a bluestem, a member of the Poaceae family. It grows to about a meter tall, or sometimes even taller. It was historically used to make brooms, hence the name. Broomsedge grows well on poor soils and comes back quickly after burns, of which there are plenty on the Florida panhandle. 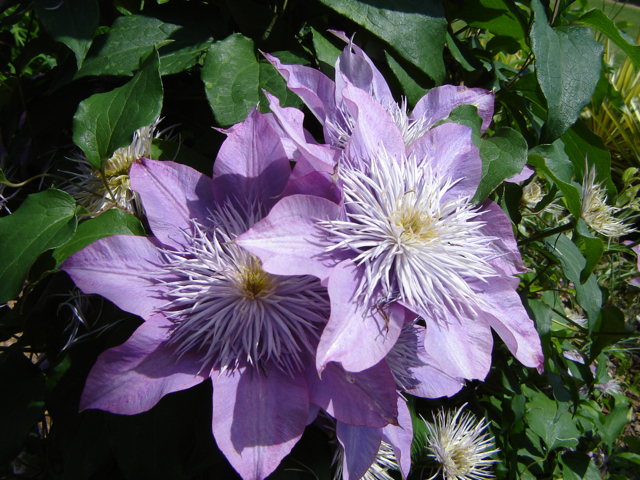 This characteristic has made it invasive in Hawaii and weedy in California, but in the southeast, it’s right at home. Imagine yourself in this large field of broomsedge, which has turned straw-colored. It’s early morning and the grass is bathed in the sun’s rays and framed by a few tall, green trees. Now imagine yourself pulling up this broomsedge, one clump at a time. For hours. When you’re done, there will be a large empty spot in the field. If you look in one direction, the sun, now high in the sky, will be beating down on the yellowy stalks. In another will be the void you have created, with a large pile in the middle. Your back will ache, your fingers will be blistered, and you will be covered head-to-toe, even under your clothes, in a layer of black soil. You will look like you’re returning from a coal mine. This is how our work trips were. I listened to NPR podcasts to pass the time and drifted off into my own little world, where all I focused on was pulling one handful of grass after another. I lost track of my boss and coworkers, and lost track of time. The hours seemed like an eternity and yet I was surprised when it was already time to eat my peanut butter and jelly sandwich. We pulled up several truckloads of broomsedge and transported it back to the island, where we plant it in the sand. After a morning spent inland, being back on the beach was a shock. A bright, reflective shock. 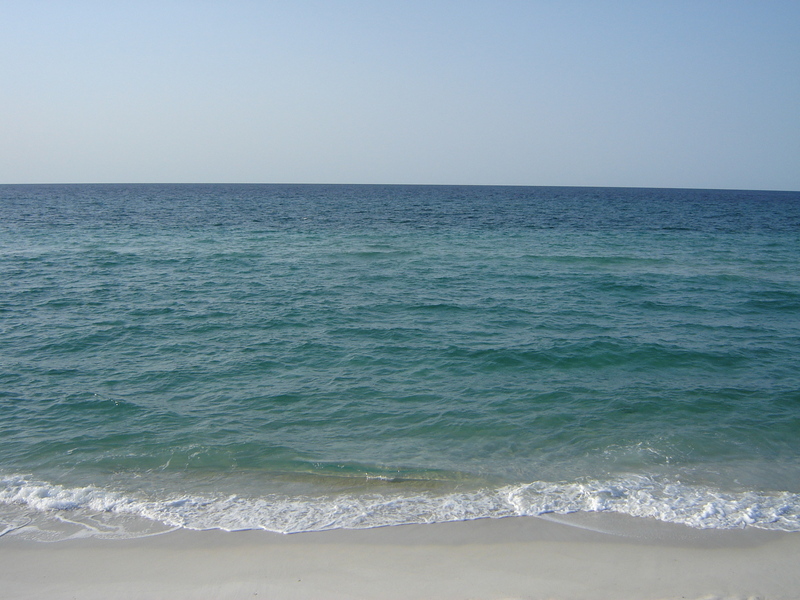 The sand was so white it almost seemed sterile, while the ocean was an impossible shade of blue. The colors of this beach are some of my favorites, but the landscape seemed static after a morning spent in another ecosystem. Today, I finished my 25th consecutive day of work. Only two of them were pulling broomsedge, but at least a dozen were planting it. Now, I am done with both tasks. We have a lot of work still ahead of us, but rearranging the distribution of one of the southeast’s characteristic plants won’t be part of it. 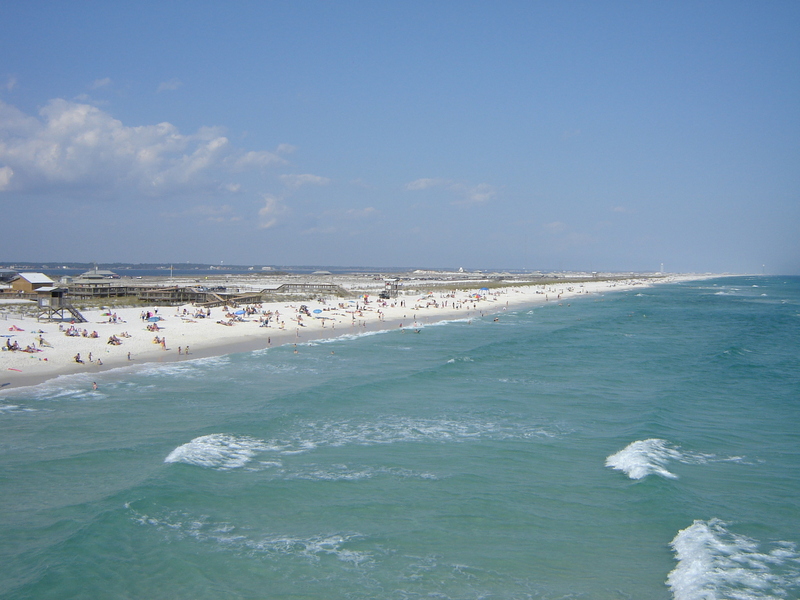 I have an entire week off as a thank-you for my work, and I’ll spend it in Atlanta, Georgia and Santa Rosa Beach, just down the panhandle. I can’t wait for a little R&R and a trip to see my wonderful grandparents. I always mean to blog more than I do, and now is no exception. While we haven’t had a full day off of work yet – this will take some creative accounting since our boss can’t afford to pay us overtime – we do get off at 3:30 p.m. every day since we start so early in the morning. I like our early mornings because they beat the heat, and as anyone who has ever seen me rollerski on a hot summer day can tell you, heat is not something I adapt to easily. One thing that has taken up some extra time is the fact that I decided to work on a long article about the mess the Russian women’s biathlon team is in. It took a few days and you can read it here. Another reason I haven’t written was that on Saturday, I was having too much fun. We haven’t had a day off, but Saturday was close. Instead of doing fieldwork, we spent the morning taking a class on riding ATV’s. All-terrain vehicles are available for us to use to haul our gear from site to site, but we had to get certified to ride them first. Hence, the class. We spend several hours zipping around cones and over obstacles. The point was to learn how to ride safely, but it was a lot of fun, too. Not to mention the easiest hours of work we will ever have. And after that, we were free for the afternoon. 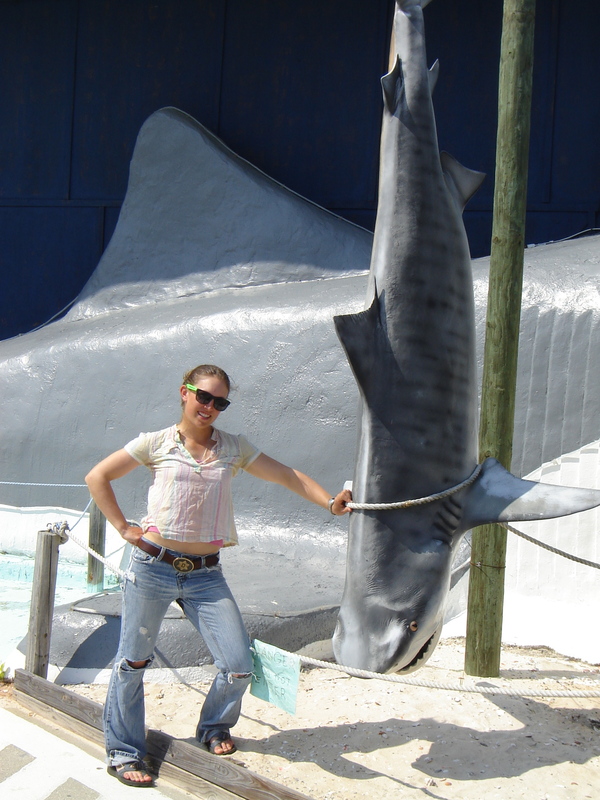 Jamie and I took full advantage of our brief window of freedom, and began by hitting up a tourist-trap shark museum and shell shop. Did I catch this guy with my own two hands? Yes, absolutely, like every other tourist. And I’m about to make him into shark soup. It will be especially delicious because he’s made out of plastic. Inside, there was a museum which actually was pretty cool. 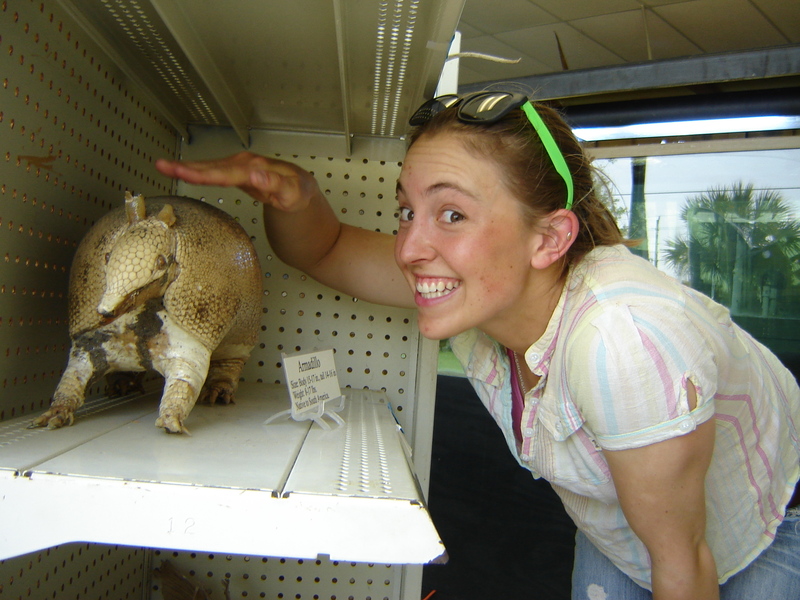 I had never seen an armadillo, which are supposedly vermin around here, but luckily there was one for me to examine so I’ll know what to look for. 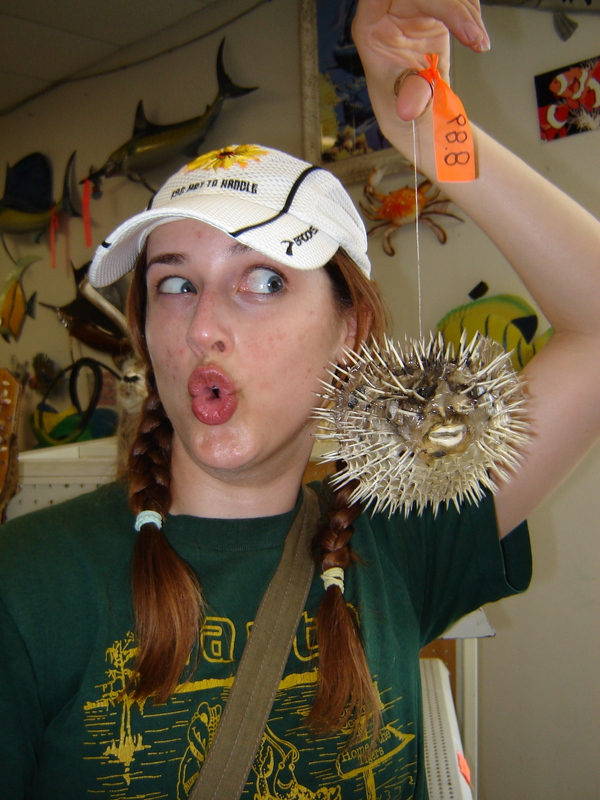 Jamie’s favorite was the pufferfish. She tried to mimic the little guy, but it was kind of tough, not being full of spikes and all. We ended up spending much too much time in the tourist trap shop, looking at shells and cheap plastic crap. I bought some postcards because I felt bad making the lady stay open when it turned out that she was waiting for a bathroom break, and Jamie bought a couple of shells for her hermit crab and some saltwater taffy which turned out to be not very good. 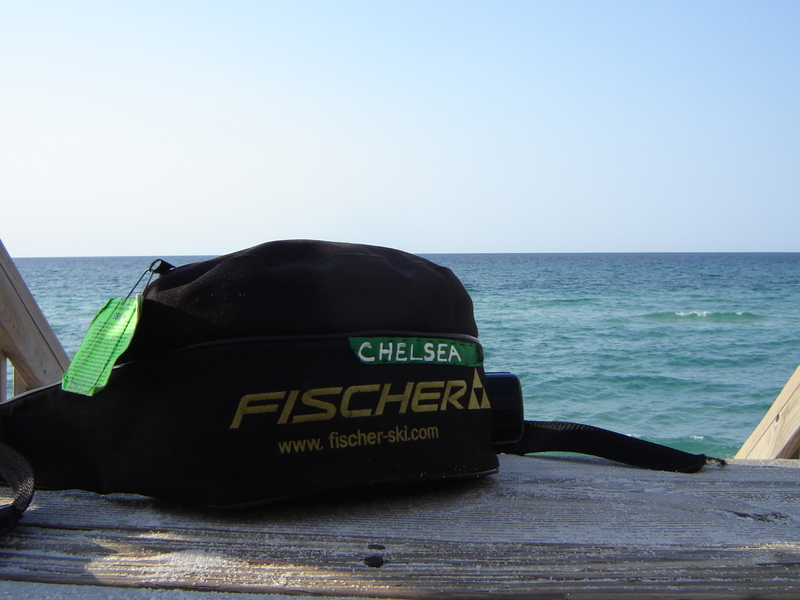 Our next stop was the fishing pier. The pier sticks 900 feet out into the Gulf of Mexico and on Saturday, it was packed with fishermen casting bait fish far out into the Gulf. We watched one lucky fisher land what seemed to me like a quite large fish, but most of the men and women seemed to be relaxing with their friends while they waited for a tug on the line. Two cute girls drove a golf cart up and down the pier selling concessions and cold beer from a cooler strapped on the back. It was cool to be able to enjoy the beach just for the beach’s sake instead of worrying about getting to work on time or already being exhausted and sweaty. Plus, out on the pier the wind was gusting and gave us a respite from the sun. I hate doing touristy things, but this was just what the doctor ordered. After touring Navarre Beach, driving through the picturesque nearby section of the Gulf Islands National Seashore, and checking out Gulf Breeze (boring), we finally finished up the trip with some snow cones. Snow cones are becoming our weekend tradition. After picking mango last weekend, this time I went with “hula girl”, a combination of polar punch (whatever that is, it’s blue) and kiwi. We were served by the aging proprietor of the stand, who was on hand, unusually, to help out his younger, entirely female crew. He had an impressively dry wit. We sat at a picnic table and savored our treats. We ended the day with a glass of wine and a dip in the pool. All in all, pretty nice. And now it’s back to the fieldwork grindstone – something our RV park neighbors never cease to comment on. “You girls are working all the time,” they say. True – but not all the time!